It’s what you actually did in 2014. I’d be a hardened pessimist if not for one thing – there’s a magic bullet that can bridge the gap between goal intentions and goal accomplishment. It’s what behavioral psychologists call “implementation intentions.” Ugly phrase, I know. But it could be the difference between achieving your goals in 2015 and failing miserably. During the next week I will partake in at least 20 minutes of vigorous exercise on (day or days) _______________ at _______________ (time of day) at/in (place) _______________. 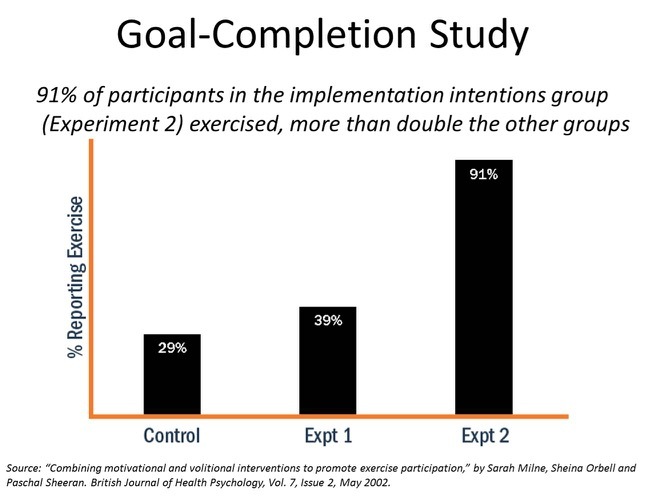 Ninety-one percent of the participants in Experiment Group 2 – the ones who wrote down their “implementation intentions” – exercised. Only 29% of the control group and 39% of those who read the health literature exercised. The results seem implausible. How could writing down what you intend to do make such a big difference? It’s no surprise to Peter M. Gollwitzer, a psychologist at New York University who’s been studying goal achievement since about 1980. His research has revealed the curious power of implementation intentions, which are anchored by “if-then” statements like the one that’s implied in the form the Experiment 2 participants filled out – “If Tuesday at 8 a.m. arrives, then I will go to the gym.” An implementation intention doesn’t just get specific about the goal. It gets specific about when and where you’re going to do things that will help you achieve it. That’s the magic of writing down if-then statements – they automate the response. They effectively trick our brains. You do what you said you were going to do unconsciously, very much like a habit. I put implementation intentions to the test recently. I wrote down on a Sunday night that Monday, Wednesday and Friday of the coming week I’d go to the gym and up my 20 minutes on the treadmill to 30 minutes. On Monday I achieved my goal. On Wednesday I woke up tired and really didn’t feel like exercising. But I went to the gym. After 15 minutes on the treadmill I started telling myself I wasn’t going to make it. I was able to do that. At the 15-minute mark, I flipped a switch and immersed myself in Margaret Atwood’s novel Oryx and Crake, eyes closed. I had an IV to narrator Campbell Scott, hearing not just the story but also his phrasing, the timbre of his voice. When I finally opened my eyes the timer on the treadmill showed 10 minutes had passed. I’d busted through the barrier. The last five minutes were easy. On Friday I hit my goal again. Okay, what’s that prove? It was just one week. But I can attest that even though I didn’t want to go on Wednesday, I never came close to caving. I’d written it down. I’d committed. My brain complied. And the audiobook trick worked surprisingly well when I encountered an obstacle. Gollwitzer cites a number of surprising studies proving that implementation intentions work. In one, students were asked to write an optional paper over Christmas break. Of those who wrote down when and where they’d write the paper, two-thirds of them did it. Of those who did not create implementation intentions, none completed the task. Studies have demonstrated that implementation intentions helped people not just get started but stay on track when trying to recycle, vote, lose weight, conduct medical self-evaluations, take daily medication and ride public transportation. To bridge that gap, Gollwitzer suggests that managers can get their team members to draft if-then statements that map desired actions to trigger events. And then draft a second set of if-then statements describing what they’ll do when they encounter inevitable obstacles. Back to those New Year’s resolutions. In the next month we’ll do the easy work of setting goals for 2015. Just like we always have. But maybe this time we’ll trick our brains with if-then statements. For some crazy reason the gray matter between our ears responds to these statements automatically, without conscious intent. And – surprise – we actually do what we said we were going to do.